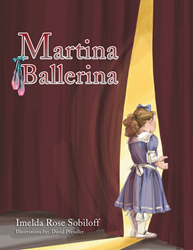 Children’s author Imelda Rose Sobiloff has released her captivating new children’s picture book, “Martina Ballerina.” The story follows a young girl named Martina who loves to dance and wants nothing more than to become a ballerina. Martina’s story of facing a challenge and ultimately overcoming it, will embolden readers to believe in themselves and follow their dreams, while also understanding the importance of discipline and rising to the occasion. Currently a five-star reviewed book on Amazon, the manuscript for “Martina Ballerina” won the Supreme award from the Authors/Writers Network of New York and New Jersey in 1989. With beautiful illustrations by artist David Pfendler that help showcase Martina’s passion for ballet and the lessons she learns along the way, “Martina Ballerina” will entertain and encourage readers of all ages to follow their dreams. To learn more please visit MartinaBallerina.com. Imelda Rose Sobiloff was once a little dancer herself, tapping out dance routines under her desk at school. As a journalist, writer, and editor, Sobiloff used her combined skills to create a delightful story for the youngest of aspiring dancers. Sobiloff knows the importance of giving back to her community and is a supporter of numerous non-profits where she gives annual donations to such as Ronald McDonald House, C.A.R.E. and Habitat for Humanity. She currently resides in Cresskill, New Jersey with her husband Peter, and they have two adult children, Christina and Michael, and a grandson named Aiden.